These findings warn that procreation in space may be fraught with peril. However, further research could help unlock ways to combat the negative effects that weightlessness has on people of all ages. The microgravity that astronauts experience orbiting Earth on the space shuttle or International Space Station can ravage their bodies on lengthy missions, atrophying muscles, weakening bones and causing irregular heartbeats. To advance longer and farther into space, researchers want to curtail these risks. By analyzing the effects of weightlessness on the cellular level, scientists in Australia now believe they have pinpointed the roots of its harmful consequences. Microgravity apparently tampers with stem cells, which all other cells originate from. Stem cells normally act as a repair system for the body by replenishing its tissues. By uncovering the origins of these problems, the investigators now hope to design remedies that can truly help fix them. "Our research is headed toward creating countermeasures that can be utilized by biomedical intervention for astronauts," said researcher Helder Marcal, a tissue engineer at the University of New South Wales in Australia. In their experiments, researchers employed human embryonic stem cells, which possess the extraordinary ability to become any other cell. 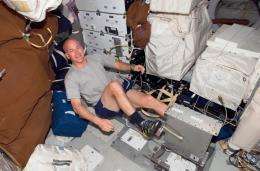 To simulate microgravity on Earth, the scientists used a NASA-designed machine which kept the cells nourished with oxygen and nutrients while constantly spinning to keep the cells in a state of freefall for 28 days. 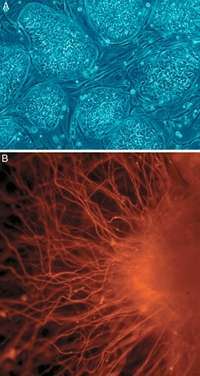 After this experiment, the cells showed vast differences on the molecular level, with 64 percent of their proteins differing from those grown under normal gravity. Specifically, these microgravity-exposed cells generated more proteins that degrade bone and fewer proteins with antioxidant effects. Antioxidants protect against reactive oxidants that can damage DNA. Microgravity also influenced levels of a broad range of other proteins. These include those involved in cell division, the immune system, the muscle and skeletal systems, calcium levels within cells, and cell motility. These findings in embryonic stem cells may not bode well for attempts at procreation in microgravity. "The simulated microgravity experiments we are investigating dont seem to suggest a very positive outcome," Marcal said. Some of the detrimental risks that microgravity may have on an embryo include inhibited bone maturation, heart and blood vessel alterations, delayed neural growth, and altered muscle tissue maturation, Marcal speculated. "The effect that microgravity may have on a growing embryo or fetus would be similar to an adult body  however, much more detrimental," Marcal said. "The adult body can adapt to some microgravity space environments  however, what remains totally unknown is if an embryo can adapt to such an environment too." The researchers now aim to decipher why exactly microgravity is having these molecular effects. "What we are almost certain of is that the human body depends and relies on gravity for some mechanical or circulatory feedback," Marcal said. Mechanical feedback is needed by bone, while circulatory feedback is needed by blood vessels. "Vessel walls become weak and our circulation and immune system becomes compromised," Marcal explained. The researchers are now testing other cell types to analyze the effects of simulated microgravity on those. In addition, they are working on tissues grown from cells that actually flew on one of the recent space shuttle missions. "Thus we are hoping to combine and complement our ground-based experiments with those in real space conditions," said researcher Brendan Burns, a biologist at the University of New South Wales. "Human procreation in space is inevitable, I believe," Marcal said. When it comes to whether or not medical interventions might protect embryos and fetuses from the hazards of microgravity, "therapeutic and pharmaceutical intervention may not be the optimum outcome," Marcal said. "Humans may have to consider that in the not so distant future, genetic engineering our bodies may the way forward if we are to explore planets in our solar system. However, this raises other ethical and moral issues." The scientists detailed their findings at the Astrobiology Science Conference 2010 in Texas in April.